If you haven’t heard about the SANE Solution Diet and Meal Plan, you’ll be hearing A LOT about it soon. The buzz surrounding the SANE Solution Diet and Meal plan has become incredibly loud. There is a reason for that. The SANE Solution Diet and Meal Plan boast more than 100,000 success stories. These folks have lost weight effortlessly and permanently. They’ve written testimonials about how the SANE Solution Diet and Meal Plan reversed their diabesity, high blood pressure, and high cholesterol. Many of them have even been taken off of their blood pressure, cholesterol, and/or diabetes medications! Some of our SANE Solution successes tell their stories in the Diabesity Solutions Series that premiered online in October 2018, which only added to the very positive buzz. We expect the buzz to become deafening in December 2018, when Jonathan Bailor’s new book, The Setpoint Diet, is published. 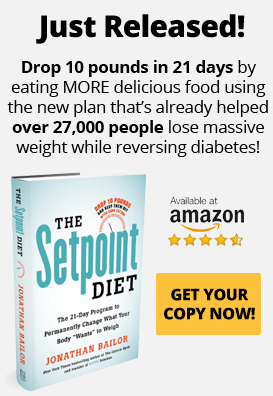 The Setpoint Diet: The 21-Day Program To Permanently Change What Your Body Wants to Weigh,” not only details the SANE Solution Diet and Meal Plan, but it also tells you how it works to facilitate permanent weight loss. Picture this: no more starvation dieting, hunger, or deprivation. No more yo-yo dieting. No more diabesity…and a reduced risk of diabesity related diseases. This is not a fantasy. It is a reality experienced by thousands of people. You can certainly be one of them. We want to help you become the very best version of YOU. We know the SANE Solution Diet and Meal Plan can help you easily shed stubborn pounds, while also helping you feel great. What, you may be asking, is so special about the SANE Solution Diet and Meal Plan? The SANE Solution Diet and Meal Plan are unlike any weight-loss program you’ve ever tried. It has been clinically proven in over 100,000 studies to unclog hormones, lower setpoint weight, and facilitate permanent weight loss. It is the only such program approved by top doctors at The Harvard Medical School, Johns Hopkins, The Cleveland Clinic, The Mayo Clinic, and UCLA. The SANE Solution Diet and Meal Plan work with your body to ignite your body’s natural fat-burning and blood-sugar balancing power. This leads to weight loss, ultimately reversing obesity. Its blood-sugar stabilization effect also leads to a reduction of diabetes symptoms, ultimately reversing type 2 diabetes. And what about other diseases and health conditions? Well, the SANE Solution Diet and Meal Plan can help prevent, treat, or heal them, too. This is because most health problems have an underlying nutritional basis. You see, the foods you eat give your cells the information and materials they need to function at peak efficiency. If you do not eat enough food, or the foods you eat are low quality, they cannot properly run your metabolic processes, causing your health to gradually go downhill. You can eventually become overweight or obese. You can develop type 2 diabetes, heart disease, osteoporosis, osteoarthritis, many types of Cancer, and other diseases. But isn’t there a genetic component to most diseases? Yes, research indicates that your genes (inherited DNA) play a role in most diseases. If a close relative has type 2 diabetes, for instance, you have an increased chance of developing this disease, too. Or so researchers say. But there are other educated voices saying something different. Contrary to popular belief, DNA is not destiny, these researchers say. The science of epigenetics has yielded some fascinating discoveries. Epigenetics is the study of the changes in organisms brought about by modification of gene expression rather than alteration of the genetic code. Our DNA — the 25,000 genes discovered by the Human Genome Project — gives instructions to the human body. But these genes need to be told what and how to do something. How else could the DNA in a liver cell and the DNA in a brain cell know to code for only those proteins needed for the liver and the brain, respectively? Only recently, however, have scientists found that epigenetic signals from the environment can be passed from one generation to the next, even several generations. Research shows epigenetic changes caused by your diet — and other factors — may affect your children, grandchildren, great-grandchildren, etc. So, while you may, indeed, have a genetic predisposition to a certain disease, it may have been caused by your ancestor’s poor-quality dietary habits. And fortunately, you have the ability to change the epigenetic signals from your environment — your diet — to prevent or heal these diseases in your life and to prevent your or ancestors from falling victim to them. Quite frankly, the SANE Solution Diet and Meal Plan is not just one way to lose weight; it is the ONLY way to lose weight long term. And once people learn about and implement the SANE Solution Diet, the twin epidemics of obesity and type 2 diabetes will be a thing of the past! Government health officials, nutritionists, doctors, scientists — and hundreds of millions of “regular” people — want to know how to reverse type 2 diabetes and obesity these days. There is a reason for that. Type 2 diabetes and obesity have become worldwide epidemics, quickly becoming the largest, most dangerous public health crisis the world has ever seen. In America alone, more than 100 million people have diabetes or prediabetes. According to a Centers for Disease Control Report, as of 2015, 30.3 million Americans have been diagnosed with diabetes. Another 84.1 million have prediabetes. (If not treated, prediabetes often leads to type 2 diabetes within five to ten years.) This is not a small concern as type 2 diabetes is the seventh leading cause of death in the United States. Meanwhile, more than 70% of U.S. adults are either overweight or obese; a whopping 36% are obese. (Source: Centers for Disease Control) Obesity is a medical condition in which the level of body fat is severe enough to seriously affect health. (Generally speaking, weighing 20% above “normal” weight is classified as obese.) Obesity increases the risk for many health conditions; indeed, it is the underlying cause of or contributing factor to most diseases. Both type 2 diabetes and obesity seriously impact health. And here’s the thing…it is no accident that they are twin epidemics. The link between type 2 diabetes and obesity is such a well-established fact that the term “Diabesity” was coined to describe the interrelationship between these two diseases. If you’ve never heard the term Diabesity, you’re likely to hear quite a bit about it in coming years. Let’s delve into this term to help you better understand this disease. Even people familiar with the term Diabesity are unclear about its true meaning. Diabesity is, strictly speaking, a condition in which type 2 diabetes and obesity exist simultaneously. However, you need not have full-blown diabetes to be diagnosed with diabesity. Rather, diabesity refers to a continuum of blood-control issues. It is a diabetic continuum that includes insulin resistance, obesity, prediabetes, metabolic syndrome, syndrome x, adult-onset diabetes, and type 2 diabetes. Scientists have known for a long time that obesity significantly increases the risk for type 2 diabetes. It is only fairly recently, however, that they discovered the nature of this link between obesity and type 2 diabetes. It involves the hormone insulin, which leads to weight gain, then diabetes, then type 2 diabetes — or leads to type 2 diabetes, then weight gain, then obesity. This is how it works: type 2 diabetes means insulin is building up in your bloodstream. Insulin is the fat storage hormone, and having an excess amount in your bloodstream makes it almost impossible for your body to burn stored fat for fuel. This makes it almost certain you will develop obesity. Similarly, being obese means your metabolic system — which includes your brain, gut, hormones, or all of them — cannot do their job to regulate your weight. This leads to insulin building up in your bloodstream, which leads to type 2 diabetes. So, if you are diagnosed with one of these diseases — obesity or type 2 diabetes — and nothing is done, the other disease will eventually follow. This is a scientific fact. According to the Centers for Disease Control, about 90% of those who are obese will develop type 2 diabetes. It is no wonder, then, that type 2 diabetes and obesity are both epidemics that show a similar rate of growth over the past few decades. The global prevalence of adult diabetes has nearly quadrupled since 1980. According to the World Health Organization, 108 million adults worldwide had diabetes in 1980. That number had risen to 422 million in 2014. Similarly, the global prevalence of adult obesity has nearly doubled since 1980. Given the growth rate of both diseases, it’s no surprise that Diabesity has become a huge and serious public health threat. Diabesity directly impacts more than 1 billion people worldwide, including 50% of Americans over 65. These numbers make Diabesity the largest health epidemic in human history, according to a 2017 report published in Clinical Diabetes and Endocrinology. And it is going to get even bigger as the millions of people with prediabetes develop type 2 diabetes. Certainly, the health impact it will have on hundreds of millions of people worldwide will be devastating. It is very important to pay attention to any signs that indicate you may have this disease. If you notice any of these symptoms, you should not only see your health provider right away, but you should also go SANE. The SANE Solution Diet and Meal Plan can prevent or reverse Diabesity and its symptoms, which will reduce your risk of developing the many diabesity related diseases and health problems. If untreated, Diabesity will eventually lead to death. You are probably aware of the health risks of both obesity and diabetes. If you are overweight or obese, you know you are at increased risk of developing Diabesity. This probably frightens you on some level, yet you know you can’t do anything about it. After all, it’s not as if you haven’t tried to lose weight — many, many times. If diets worked, there wouldn’t be an obesity epidemic, and the weight-loss industry probably wouldn’t be making so much money. But if diets don’t work, why are so many people dieting? Why do they go on one diet after another, only to wind up with the same results? Haven’t you been there, too? How many diets have you been on in your lifetime? How many times have you lost 10, 20, 30 or more pounds, only to gain it all back and then some as soon as you went off the diet? This destroyed your self-esteem. You felt defeated, worthless, ashamed, a failure. You wondered how those naturally thin people got to be so lucky. What do they have that you don’t have? The answer? Nothing. You see, naturally thin people don’t have anything that you can’t have, too! All it takes is understanding how your body works and then working with your body to lower your setpoint weight. To be clear, you did not fail any of those traditional diets you tried. They failed YOU. These diets gave you incorrect information, which you trusted and followed. But that’s not your fault. It is their fault. Once you know the correct information that we’ll teach you here, you’ll know how to lose weight safely, effortlessly — and permanently. The main piece of incorrect information you learned is that a calorie is the same as any other calorie and that by creating a calorie deficit, you will force your body to burn fat. Nothing could be further from the truth. For one thing, countless clinical research studies show a calorie is not the same as any other calorie. They have different effects in your body depending upon the foods from which they come. For instance, eating a serving of high-quality protein fills you up fast and keeps you full for a long time, does not cause surges in blood glucose levels, and takes more calories to digest than carbohydrate or fat. High-quality protein is not likely to cause fat storage or weight gain. Compare this to eating a large plate of spaghetti with a couple pieces of garlic bread. These and other starchy foods are digested quickly, converted into glucose, and then dumped into your bloodstream all at once. The pancreas releases the hormone insulin to clear the excess glucose from your bloodstream. Normally, insulin takes glucose to your cells to be used for immediate energy or stored for later usage. But insulin has only a short time to clear glucose from your bloodstream before it reaches toxic levels. So insulin takes most of the glucose to your fat cells, making starchy carbs one of the most likely types of calories to be stored as fat. And then there’s the calorie-deficit theory of weight loss. If you deprive your cells of the nutrition they need, this theory says, it will force your body to burn fat. The “experts” can even tell you how many pounds you’ll lose if you’ll just reduce your diet by 500 calories a day. (Do this for a week, they say, and the deficit of 3,500 calories you’ve created will give you a one pound weight loss.) Do this for a couple of months, and you’ll drop 8 pounds. There’s only one problem. The math never works out that way. When you start to cut calories, your body’s metabolic alarm goes off. It signals your body that you are not consuming as much as you normally do. In response, your body demands more food and starts burning fewer calories. Appetite goes up, calorie burn goes down. When you try to lose weight by starvation dieting, your body fights you every step of the way. It does not know you want to lose weight. It thinks you’re actually starving. Regardless of how overweight or obese you actually are, your body thinks that is the weight you’re supposed to be. It does everything it can to keep you near this setpoint weight. Diabesity is caused by a breakdown of the automatic balancing systems that control our blood sugar and body weight. This homeostatic balancing system is commonly known as the setpoint. The setpoint is that invisible force inside you that is conspiring to hold onto those dangerous extra pounds. Losing weight — and keeping it off — has nothing to do with calories, points, intense exercise routines, mail-order meals or any of the other traditional dieting “hooey” you’ve been told. So what Is Setpoint Weight and what is its connection to Diabesity? The human body is a beautifully complex biological machine. Your brain, your digestive system, and your hormones all work together through a highly coordinated system to help stabilize your body weight and blood sugar—the same way they automatically stabilize your body temperature and blood pressure. To stabilize your body weight, they talk to one another through various feedback loops to synchronize the activities that automatically maintain body fat and blood sugar at a specific level (your setpoint). Though a calorie deficit is necessary to lose weight — and you will lose weight on a starvation diet — the weight loss will not be permanent because the poor-quality foods you consume did nothing to lower your setpoint weight. Your long-term weight and wellness are all about your setpoint. Though about 50% of your setpoint weight is determined by genetics, the rest is determined by lifestyle factors. Everything you do affects your setpoint weight, positively or negatively. For instance, routinely eating a poor-quality diet of starchy carbs, sugars, and heavily processed foods lead to brain inflammation, gut dysbiosis, and hormonal dysregulation (see below) that elevate setpoint weight. Eating a SANE Solution Diet composed of non-starchy vegetables, nutrient-dense protein, and whole-food fats lower your setpoint weight. Chronic stress, sleep deprivation, and prolonged extended exercise can also elevate setpoint weight. There are three factors that elevate setpoint weight: brain inflammation, gut dysbiosis, and hormonal dysregulation. The hypothalamus, an almond-sized structure located in the center of your brain, regulates and controls your metabolism. If the hypothalamus becomes inflamed, your setpoint goes up, and you will likely develop Diabesity. This is because when inflamed, the hypothalamus cannot receive proper signals from hormones that tell it how much fat you have or need. It can no longer properly balance calories in with calories out, so it ends up giving your more fat than you need. Inflammation is not always a bad thing. It is a vital part of the healing process that the body uses to repair itself. Inflammation only becomes a problem if it continues too long and becomes chronic. This can damage your organs. In fact, researchers now believe inflammation underlies many serious health problems, such as heart disease, Alzheimer’s, Cancer, dementia, depression, anxiety, and Diabesity. What causes the hypothalamus to become inflamed? Research shows the main culprits to be sugar, processed carbs, low-quality fats, and MSG, a food flavoring. Your body is composed of an estimated 100 trillion cells, only about 10% of which are human. That’s right. Some 90% of your cells are bacteria, most of them living in your gut. Bacteria residing in your gut and digestive tract have a major influence on your setpoint. Collectively called “gut microbiota,” these bacteria are responsible for a variety of tasks. For instance, they extract calories from the food you eat. They also store calories for later use as body fat. Some of these bacteria even have an impact on neurological inflammation and whether or not you develop Diabesity. In addition, research indicates people with Diabesity have a significantly higher level of Firmicutes bacteria and a lower level of Bacteroidetes bacteria compared to people without Diabesity. The types of bacteria in your gut are heavily influenced by diet. Eating a poor-quality diet of processed carbs, sugars, etc. “feeds” the Firmicutes bacteria and kill the Bacteroidetes bacteria. Eating high-quality foods on the SANE Solution Diet does just the opposite, ultimately lowering your setpoint weight. Having a “hormonal clog” is one of the main reasons for an elevated setpoint weight. When you become hormonally clogged, your brain can no longer correctly “read” the signals from your hormones that would otherwise enable you to burn body fat automatically. However, when you increase the quality of your eating, you can unclog your hormones and begin to lower your setpoint. To understand how this hormonal clog elevates your setpoint, think of your body as functioning like a sink. When a sink is unclogged, any water you pour into it will quickly drain right out. The water level may rise temporarily, but the sink will automatically take care of it. The sink is balancing water in and water out at a low level. You can think of an unclogged sink as having a low setpoint. A hormonally healthy body works similarly. To automatically prevent excess body fat from accumulating, it responds to more calories in with more calories out, and to less calories in with less calories out. When water builds up in sinks and fat build up in bodies, it is because they have become clogged. What causes clogs? You guessed it. Clogs only occur in sinks and in bodies when the wrong quality of things are put into them, causing the level of water or fat to rise and remain high. Now you have an elevated setpoint. When you put poor-quality foods into your body, it becomes hormonally clogged, causing it to automatically balance you out at an elevated level of body fat and also an elevated level of blood sugar, leading to Diabesity. The good news is that the SANE Solution Diet and Meal Plan will remove that clog, allowing your body to automatically balance you at a lower level of body fat. The SANE Solution Diet and Meal Plan are easy to remember and apply. There are no complicated menus or foods to remember. You will not be hungry or feel deprived. That’s because, on the SANE Solution Diet, you will concentrate on the quality of the foods you eat, not the quantity. High-quality foods are filling and have little effect on blood glucose levels, automatically ensuring you’ll eat fewer calories. At least 10 servings per day. Fill half your plate with non-starchy vegetables at each meal. On the SANE Solution Diet, you’ll eat MORE food, lower your setpoint weight, and heal Diabesity. How awesome is that? 5 Sane Solution Reviews: They Did it and So Can You Does the Setpoint Diet Work?